If the New American Standard Bible, Updated Edition, is your favorite translation, then The Strongest NASB Exhaustive Concordance is indispensable. With over 400,000 entries listing every word in the updated NASB, it gives you a powerful and essential reference tool for scaling the heights and plumbing the depths of God’s Word. Locate even the most obscure Scripture verses quickly and easily. Conduct thorough, revealing word studies that uncover shades of meaning from the original Bible languages. Organize your own studies on subjects of your choosing. 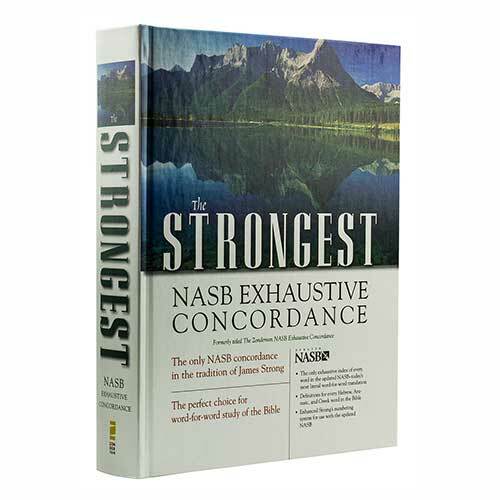 The Strongest NASB Exhaustive Concordance lets you do it all. It’s the cornerstone of your NASB resource library. Every word in the updated NASB listed alphabetically and referenced in order of appearance in every book, chapter, and verse of the Bible.